Gigabyte released some information about its upcoming X79 motherboards. These boards will get new 3-way digital PWM controllers, full details and photos of the mainboards can be found over here. Let's start with the new digital PWM controllers. What we're looking at is one controller, or "digital engine" as Gigabyte seems to want to call it, for the CPU and two for the memory, i.e. one for each pair or quad of DIMM's depending on the motherboard layout. The controllers are made by International Rectifier, which recently acquired CHiL which is a well-known brand of a wide range of power related ICs. Because of the split memory banks, adding a separate power regulation circuitry to each side of the motherboard allows for an overall simpler board design in terms of power delivery. 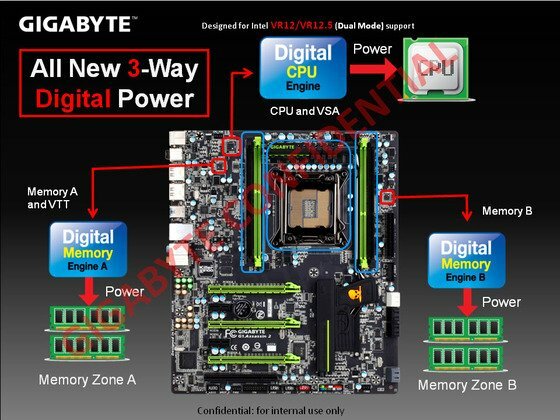 All of Gigabyte's X79 boards are also compatible with both the Intel VR12 and VR12.5 specs which suggest that we might be seeing support for Ivy Bridge-E on the X79 platform.